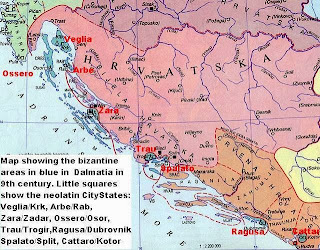 Map (in croatian language) of the 8 Dalmatian city states, painted in the medioeval political division of Dalmatia: Crespa-Ossero in actual Cherso (Chres); Vecla in actual Veglia (Krk); Arba in actual Arbe (Rab); Jadera in actual Zara (Zadar); Tragur in actual Trau (Trogir); Spalatum in actual Spalato (Split); Ragusium in actual Ragusa (Dubrovnik); and Cattaro in actual Cattaro (Kotor). If needed, click on it to enlarge the map. 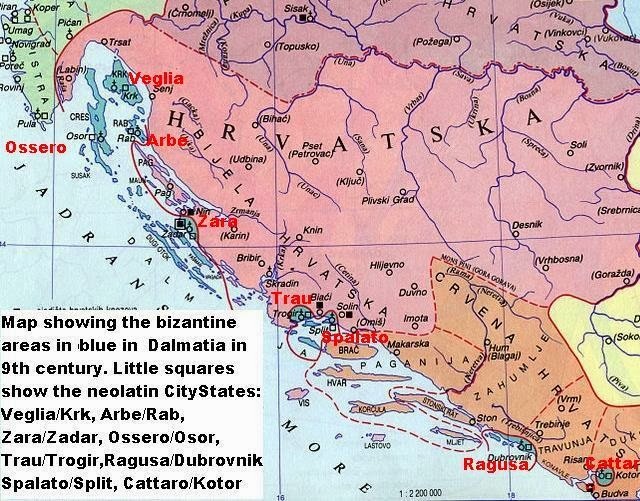 Little is known actually about the Dalmatian city states with neolatin ethnic roots, originated from the province of Roman Dalmatia. These were a group of maritime cities where the roman population of Dalmatia took refuge from the barbarian invasions, that destroyed the Western Roman Empire. Initially these survivors got refuge in 8 places: all of them were on northern dalmatian islands (like Arbe, Ossero, Veglia) or little islands just in front of the dalmatian coast (like Zara and Ragusa, and -even now- Trau), but two of them (Spalato and Cattaro) were "isolated" by special factors (Spalato by the walls of the Diocletian "palace", and Cattaro by the "fiord" mountains surrounding the Bay of Cattaro). These cities remained with their own latin characteristics from the seventh century until were "assimilated" by the Republic of Venice in 1409 AD. Only Ragusa maintained a form of political independence (even if nominally dependent of the Ottoman empire) until Napoleon times: the "Repubblica di Ragusa" was the last of the Dalmatia's neolatin City States and lasted until 1808 AD. The original Dalmatian romance language disappeared from official use around the thirteenth century, according to Luciano Montali, even if the last speaker (named Tuone Udaine) died in Veglia in 1898 AD. The (neolatin) Dalmatians of the maritime cities on the contrary were brought into contact with the nations of western Europe, and above all with Italy, and though their architecture bears traces of Byzantine influence as late as the twelfth century, they developed after that period a native art of their own, and have left us a series of architectural monuments not inferior in interest to those of any country of Europe. Their style is principally based on that of Italy ....."
Indeed Fiume was the former Roman 'Tarsatica': the city of that medioeval period was a small fortified town under the italian Aquileia/Pola bishop, enclosed within the town walls which had several defense towers. The town was granted authonomy in the eleventh century by the bishop and was divided into two parts: in the upper part, there was a medieval castle and the church of St. Vitus (thus the name 'Flumen Sancti Viti'), while in the lower part - the popular- there was a commercial and trading center where around the year 1000 AD many Italian merchants settled. "....In 1167 Stephen III raised Sebenico to the rank of a 'free city' conferring on it a charter and privileges similar to those enjoyed by the old Dalmatian cities of Trau and Spalato, and from that time forward Sebenico must be reckoned as within the 'Dalmatian Pale', though a Croatian town by descent and tradition. Lucio says the Sebenzani were some time in learning to wear their new privileges easily; accustomed for so long to be governed despotically, they accommodated themselves with difficulty to the Dalmatian (latin) laws; they had Counts appointed for life, and not for a short term like the other cities, who were with difficulty restrained from their old habits of piracy, and they were more exposed than the other cities to the arbitrary interference of the Ban. Gradually however the Sebenzani became Latinized, and in later ages the city was described by Fortis as next to Zara the best built in Dalmatia, and inhabited by the greatest number of noble families, as far removed from the barbarous manners of ancient pirates as their houses are unlike the former cottages or sibice; and the same writer tells us that in the sixteenth century the arts and sciences flourished in this city more than in any other of Dalmatia...."
According to the "1911 Encycledia Britannica" in 1508 AD the hostile league of Cambrai compelled Venice to withdraw its garrisons for home service in the Veneto region, and after the overthrow of Hungary at Mohacs in 1526 AD the Turks were able easily to conquer the greater part of Dalmatia. The peace of 1540 AD left only the maritime cities to Venice, the interior forming a Turkish province, governed from the fortress of Clissa.